Research can be part of the solution to the slow growth trends in U.S. organic production, because research topics often relate to challenges faced by organic farmers. Unfortunately, USDA expenditures on research related to organic agriculture have stagnated, while overall USDA research expenditures have grown significantly. NOC is calling on Congress to increase funding for the Organic Agriculture Research and Extension (OREI) initiative to $50 million annually. Because of the focus on soil health and alternative pest and disease management strategies, organic research benefits organic and conventional farmers alike. NOC endorses the Organic Agriculture Research Act (H.R. 2436, S. 2404), introduced by Representatives Pingree, Newhouse and Panetta and by Senators Casey and Collins. This legislation would increase OREI funding from $20 million to $50 million annually (in the Senate legislation proposes to increase funding gradually until reaching $50 million annually in 2023). NOC applauds Congress for increasing funding for the Organic Transitions Program to $5 million annually in the in the Fiscal Year 2018 Omnibus Appropriations bill that passed on March 23, 2018. The two USDA organic-specific research programs, the Organic Agriculture Research and Extension (OREI) initiative and the Organic Transitions Program (ORG), are extremely important, but their funding has been level in recent years. In contrast, the larger competitive grants research programs at USDA that could be funding organic research, such as the Agriculture and Food Research Initiative (AFRI), and the Specialty Crop Research Initiative (SCRI), have experienced significant growth in recent years. Yet the percentage of these programs dedicated to organic research is miniscule. According to USDA’s own data, AFRI funding dedicated to organic research has averaged about two-tenths of one percent (0.2 percent) annually. 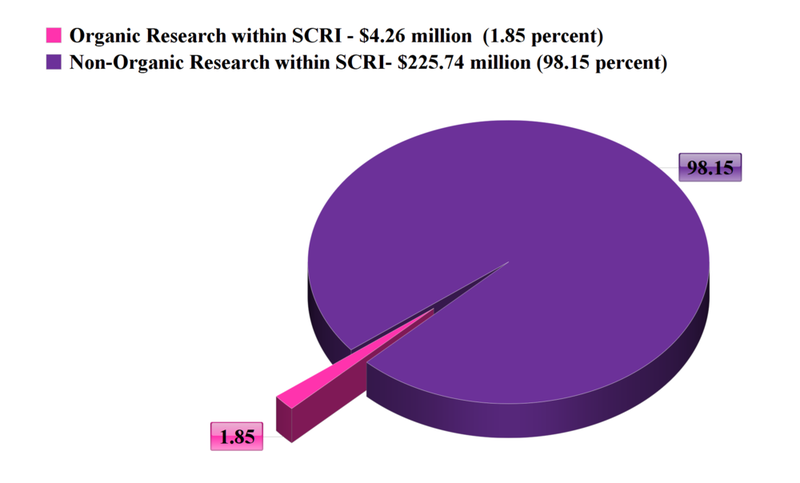 Less than 2 percent of the SCRI program was spent on organic research over the 2010-2014 timeframe. NOC is calling on Congress to ensure that the AFRI program addresses the needs of the full spectrum of the U.S. agriculture sector, including the organic sector. While USDA has taken some steps in recent years to encourage research proposals on organic topics, more aggressive steps must be taken by USDA to address the research needs of the organic sector. For more information and analysis related to organic research, see NOC’s white paper on Expanding Organic Production in the United States.